Gov. Roy Cooper announces his final two cabinet secretaries Tuesday. Gov. Roy Cooper named his final two cabinet secretaries Friday, announcing his choices to lead the department of Revenue and Information Technology. Ron Penny, who has been serving as acting secretary at Revenue since January, was named to the position permanently. Penny, a graduate of N.C. A&T and UNC School of Law, had his first post-college job in the department’s mail room. Eric Boyette, formerly the Chief Information Officer and Acting Commissioner at the state Division of Motor Vehicles, will head IT. Boyette worked in IT and other management positions at the state’s Department of Transportation for a decade. 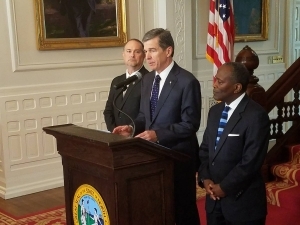 From a bruising battle over HB2 to the override of his first veto and a flurry of conservative legislation, Cooper has had a busy first few months in office. He denied that a lawsuit over the N.C. Senate’s authority to confirm his cabinet nominees played a part in his last two secretaries being named so late. The Senate ultimately prevailed in that fight, issuing subpoenas to compel Cooper’s appointees to participate in confirmation hearings. Though Cooper’s nominees have so far been approved fairly easily, the issue remains the subject of litigation.